The big picture topography of the Sierra Nevada in California is a large flat slab of granite tilted up towards the east so that the western side has a very gradual slope up, while on the east is a very abrupt escarpment. But in more detail, the western side is dissected with many deep canyons and their rivers, the most notable being Yosemite and the Merced River. But in volume of water, more significant is the San Joaquin system. 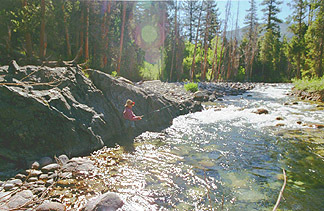 At the beginning of this month, August `01, I made a fishing pilgrimage with my wife Pat to the headwaters of the South Fork. Driving there, if not an adventure was at least an interesting effort. The trailhead is at the east end of Florence Lake. To get there one goes east from Fresno in the central valley up past a couple of Southern California Edison Company hydro impoundments, Shaver Lake and Huntington Lake to finally reach Florence. After Huntington is where it gets interesting, but rather than enlarge on this I will refer you to a web site http://www.muirtrailranch.com/kprsurvival.html with instructions we found helpful in surviving the experience. Since Florence is at 7500 feet we gave ourselves an overnight nearby to accustom our sea level bodies to the altitude. From the west end of Florence you have the choice of hiking eight miles of lakeshore or taking a four mile ferry out the east end near where the South Fork empties into the lake. We took the ferry. Our plan from there was a backpack trip fifteen miles up the South Fork to its source at Martha Lake at 11,000 feet, cross over Ionian Basin to Muir Pass at 12,000 feet and descend the Evolution Creek watershed to where it joined back to the South Fork and back out, sampling the fishing as time and waters offered themselves to us, taking nine or ten days to do it. It didn't work out quite that way, but I have no regrets over what we did do. The first part of the trip was in the John Muir Wilderness of the Sierra National Forest, while higher up we got into the northern part of Kings Canyon National Park. Fortunately the USFS and the USNPS have a mutual wilderness permit arrangement so that wasn't a problem, but they are both quite emphatic about the bear problem. The bane of the Sierra backpacker's life is the overnight food storage problem. It used to be that one could hang food over high tree limbs far enough out that a heavy bear couldn't get out to it without being dumped. But mama bears started sending the cubs out after it. They will do kamikaze leaps from the limbs thirty feet up to grab it and drag it down with them. These are black bears, not grizzlies, and rarely attack humans, but you don't want a foraging visit from one in the middle of the night, which you might well get if you try to protect your food by sleeping with it close. The solution to the problem these days are bearproof containers, black ABS plastic cylinders, about 8" in diameter, 12" to 18" long, too big from them to crush with their jaws. They have lid on one end operable with coin slot latches. Please, please do not respond to any bear asking you for spare change, no matter how cute you think he is! The containers are awkward to pack. I used to rate backpacks in numbers of watermelons they would hold, now it's in bearproofs. The upshot of all this was that with ten days food in a couple of bearproofs, I started out packing 70 plus pounds. There's a line on the wilderness permit application asking how many head of stock (as in mules, burros etc.) would we have. Pat suggested one--me. The ferry schedule arranged it so that we didn't hit the trail until about 11 a.m. on the first day. The first part of the trail is over two or three miles of south facing granite slabs and was rather purgatorial in the heat of the day. We quit after about five miles and found a campsite near the river. With camp set up, we rigged up and went fishing. I worked my way up a likely looking riffle about a hundred feet long, fishing a dry fly to pockets. I didn't get many hits until I got to a cascade pouring into the head of the riffle. Then in quick succession I hooked up with six or eight rainbows in the eight to twelve inch range. That's how it went, the best fish and fishing in this section were to be found at the transitions. The bottom end of the same riffle where it poured into a pool was also good. There is usually an "alpha" fish in the foamy region where the waters pour into the pool. It was no exception here, I got a hook-jawed fourteen inch rainbow out of that spot. By Sierra standards for high altitude wilderness fish, this was a trophy. The next day was a long and hard one. We were still working on our agenda of crossing Ionian Basin to Muir Pass and did eight miles and a couple of thousand feet of altitude gain. 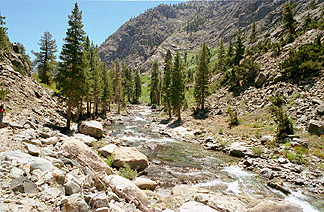 This took us past the junctions of the South Fork with Paiute Creek and later Evolution Creek and into Kings Canyon National Park. We stayed with the trail along the river, which took us into Goddard Canyon. Here the character of the river changed a lot due to the underlying geology. The classic rocks of the Sierra are various kinds of granite, but in Goddard Canyon it's mostly dark metamorphosed sedimentary rocks that tend to fracture in rectangular blocks. 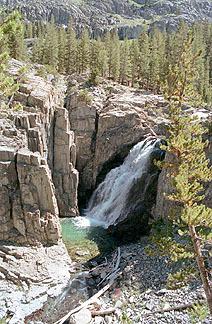 The river has cut and washed out a bed in the form of a series of deep rectangular gorges with several spectacular waterfalls connecting them, stair-stepping down the canyon. Some rock climbing skill is helpful in getting at the better fishing. A good aspect of this geology is that more minerals from it tend to dissolve into the river, enhancing the biota in comparison to the more sterile granite lined basins. After getting a camp set up, I was almost too tired to fish, but rigged up anyway. On my first cast after a six inch drift this incredible red bellied, golden sided, parr marked fish took my fly. We had reached golden trout country. The Volcano Creek Goldens are among the most amazingly colored fish I have seen, and my experience includes a considerable amount of Southwest Pacific SCUBA diving. They come generously and willingly to almost any reasonably presented fly. A well tied Royal Wulff or Humpy has about a ten minute lifetime in this fishing before it is shredded by contact with so many fish teeth. I hung one fly in the bushes, and in retrieving it I found I had pried the gape open a bit. This turned out to be quite useful, as I could get a hookup, slack the line and shake a bit, and release a fish without having to touch it. I applied the treatment with forceps to several other flies that I used. The following day took us further up Goddard Canyon past the junction for Hell-For-Sure Pass, the other approach to this area. Does the Sierra have great place names or what? We ended up at Martha Lake at 11,000 feet, the source of the South Fork. This is a windswept place above timberline, but much of the ground was carpeted with lupines. This is how much of the Sierra is--rocky bareness in the large view, but intimate and sweet flower gardens in the small. Martha Lake is in an open cirque with Mt. Goddard to the east and the LeConte Divide ringing it round to the west. On arrival, I was really too tired to fish, but went through the motions anyway. I didn't do much good. One of the keys to fishing such lakes are the upslope winds that blow in bugs from lower altitudes. You want to fish from the shore where the wind is in your face, because that�s where the bugs and the fish will be. It's tough casting when the wind is up, but if you can get a fly out there, it will drift in the right direction. By the time I got around the side of the lake where the wind was in my face it wasn't, so I all I got were a couple of desultory strikes and no hookups. The next part of our plan was to cross Ionian basin to Muir Pass from here, but we decided to take a "day off" and climb nearby Mt. 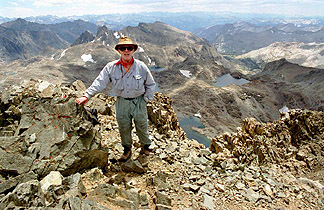 Goddard, renowned for the view from its 13,500 foot summit. The view didn't disappoint, but the climb convinced us that we didn't want to haul big packs across the basin to the pass. Mostly it was talus and scree to negotiate, but geology makes a difference. Granite talus tends to be pretty stable. This stuff wasn't granite and it wasn't very stable. Sound effects from some steps reminded us of our recycling man dumping our bottle bin after a particularly festive week. The crux of the climb was several hundred feet of the worst of this sort of stuff, but it was worth it. As someone said, the view from the summit of Goddard takes about half a day to completely take in. Back in camp, it didn't take us long to decide that continuing with out plan as set was a pretty hazardous enterprise, since it involved much of out route up Mt. Goddard, and would cost us quite a bit of fishing time if we kept to schedule. The next morning found us on a leisurely trip back down the South Fork. A couple of hours walk took us about to the Hell-For-Sure Pass junction where we camped. We spent the day becoming acquainted with the local Golden Trout population. I worked my way up one of the gorges all the way to one of the high waterfalls. As I got up there, I found myself wondering whether anyone had ever fished there before, as it took a bit of climbing to get at it. Whether or not it was true, it was a delicious feeling to be there. As it happened during the day, four Goldens had fatal accidents and were invited to dinner. The were very good prepared in Pat's backpack poaching system with wild onion tops and sage picked along the trail. Another day took us down out of Goddard Canyon into the section of the river between Evolution and Paiute Creeks. The fishing changed and we were out of the Golden Trout region. I caught quite a few fish but had to work harder to find them. The best fish of the day was a fourteen inch brown, again, a trophy for these waters. But I wonder what a mouse pattern or something like that might produce, fished at night in some of those waters--perhaps next time. Our final night out was only a couple of miles from Florence Lake and the ferry. At this point fishing got tough, as it was within the reach of day trippers, and there is a dude ranch nearby. I got only browns, not very many and not very big, but I have to admit, the trip had spoiled me. Soft hackles worked better than dries here, probably because they are not much fished in these waters. The best fly pattern of the trip is called a "Captain." It's an attractor pattern that's was mentioned several times in Charles McDermand's classic books from the `40's about fishing the Sierra. The original tie is white quill slip wings, brown hackle, a black floss body and a golden pheasant tippet tail. The updated more durable version I used has Wulff style calf tail wings and I use spooled black antron spread out like floss for the body. They held up rather better than Royal Wulffs and Humpies under the teeth of many fish. Pat and I, as old lags in our late fifties, one of us (me) with an artificial hip, are quite pleased with what we did on this trip, but sad that it's over. Out thoughts range to what we might do next year, perhaps the lower Middle Fork of the Kings River if we can figure out how to get there with a bearable amount of effort. I am sure it is very little fished.